I love blue and white china and have a nice collection of it. I feel that any and all blue and white china go together and the odd pieces look good together on the table. For at least two years I've lusted after these plates at a favorite store, Tuesday Morning. But with a$60 price tag there (and $125 retail retail), they were a bit too dear for my purse. 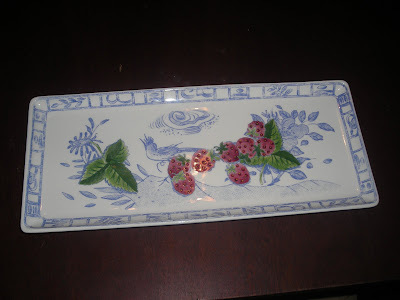 They're French and made by Gien and the pattern is called Oiseau bleu and I love the fruits in the center of the plates. I've seen them in the clearance section -- but not for 60% off and even with the percentage off, I felt that they were more than I wanted to pay. And then, the Friday after Thanksgiving, we stopped by Tuesday Morning on the way to a holiday dinner. A handwritten sign on the front door said that any one clearance item would be half of the clearance price. A frantic search up and down the aisles to see what treasure might be marked down that I had lusted after. And there they were -- these blue and white dishes that I truly have lusted after for TWO YEARS! 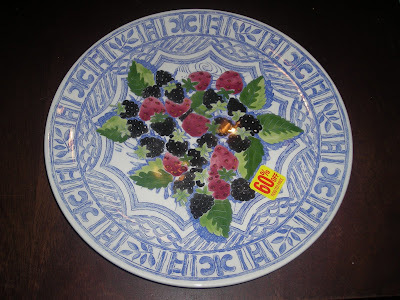 The big round cake plate was marked 60% off which meant that the $60 plate was marked down to $24 and half of that was $12. This rectangular plate was on the same shelf but didn't have a clearance sticker. But, luckily, at this store, the price is in the machine so I took it up to the register along with the round plate and asked politely if it was on clearance. It was! But only 40% off which meant that it was half of $36 or $18. A decision -- you are only allowed one item and I am trying to decide which plate I truly want when the cashier said I could go out and come in again OR she could just ring them up as separate transactions. I left with both plates. A very nice surprise on the Friday after Thanksgiving. It's nice to find something you want at a deep sale. I shall treasure this cake plate and serving tray for they will go well with my English blue and white. I can just picture a mixed berry pavlova on the cake plate. Slices of strawberry bread shall look good on the tray for an afternoon tea. Martha, both plates are just beautiful. I'm so glad you were able to get them at such a bargain. I can "hear" happy in your post. OMG, Martha, what a GREAT find. They are both just gorgeous and I can just see you using these for a long time to come. Congrats Lady on you spectacular 'find".